One man was killed Thursday morning when a barn collapsed in Knox. A Belfast man died when a barn he was working to tear down collapsed, trapping the man and injuring two others. William Viles, 55, of Belfast died at the scene at 1060 Belfast Road in Knox around 9:30 a.m. Thursday, according to a release from Waldo County Sheriff Jeffrey Trafton. Viles was part of a four-person crew working to tear down the barn. Viles was trapped and killed when the roof collapsed. 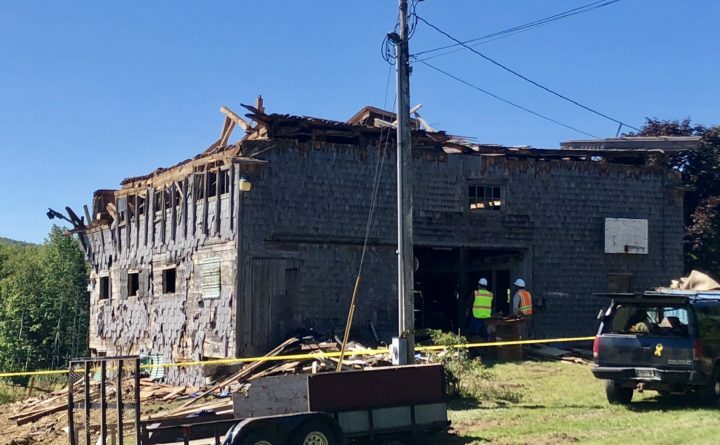 A second worker was taken to Waldo County General Hospital with non-life-threatening injuries, and a third was treated at the scene for minor injuries, according to Trafton. Suydam & Sons of Northport was the company contracted to demolish the barn. The owner of the company, William Magruder, was the fourth worker on the scene, though he was not injured. The barn is located between a house and two larger barns. The bottom half of the barn was still standing late Thursday morning, although the top half caved in. By 11:30 a.m., representatives from the Occupational Safety and Health Administration were at the scene conducting an investigation. People inside of the house located next to the collapsed barn did not wish to speak, according to a sheriff’s deputy on scene. Correction: An earlier version of this story incorrectly stated the number of people who were trapped and injured.